Background and objectives: Diabetic retinopathy is the main microvascular complication in diabetes mellitus and needs to be diagnosed early to prevent severe sight-threatening retinopathy. The purpose of this study was to quantify the retinal microvasculature pattern and analyze the influence of blood glucose level and the duration of diabetes mellitus on the retinal microvasculature. Methods: Two groups were analyzed: patients with diabetes (N=26) and patients without diabetes, ie, controls (N=26). A quantitative semiautomated method analyzed retinal microvasculature. The diameters of arterioles and venules were measured. The total numbers of arterioles and venules were counted. The ratio of arteriole diameter to venule diameter was calculated. The retinal microvasculature pattern was related to clinical and biochemical parameters. 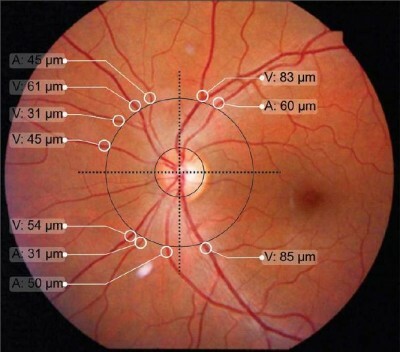 Results: Patients with diabetes exhibited larger venule diameters in the upper temporal quadrant of the retina compared to the lower temporal quadrant (124.85±38.03 µm vs 102.92±15.69 µm; P<0.01). Patients with diabetes for 5 or more years had larger venule diameters in the upper temporal quadrant than patients without diabetes (141.62±44.44 vs 112.58±32.11 µm; P<0.05). The degree of venodilation in the upper temporal quadrant was positively correlated with blood glucose level and the estimated duration of diabetes mellitus. Interpretation and conclusion: The employed quantitative method demonstrated that patients with diabetes exhibited venule dilation in the upper temporal quadrant, and the duration of diabetes mellitus was positively correlated with blood glucose level. Therefore, the early assessment of retinal microvascular changes is possible prior to the onset of diabetic retinopathy.